Integrating technology into content, instruction, and assessment can be complex and challenging. As a result, teachers are developing a new form of literacy, a collection of skills, competencies, and knowledge that involves more than a single set of knowledge and skills. It is necessary to teach technology within the contexts of what you are teaching (the content) and how you teach (the pedagogy). Knowledge of the subject matter, such as Literacy, Math, or Science. Knowledge about processes and practices or methods of teaching. 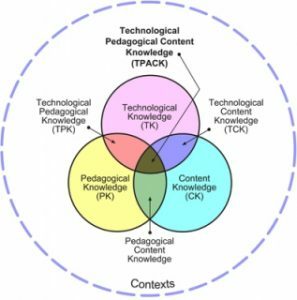 This framework is called TPACK or Technological, Pedagogical, and Content Knowledge. It takes these three main forms and explores how they interact with one another. True technology integration occurs when these three areas work together to create a dynamic learning experience for all students. As a result, these intersections form a new knowledge and new expertise that is different than the knowledge and skills required by each component in isolation. You can find out more about TPACK on Punya Mishra’s page. 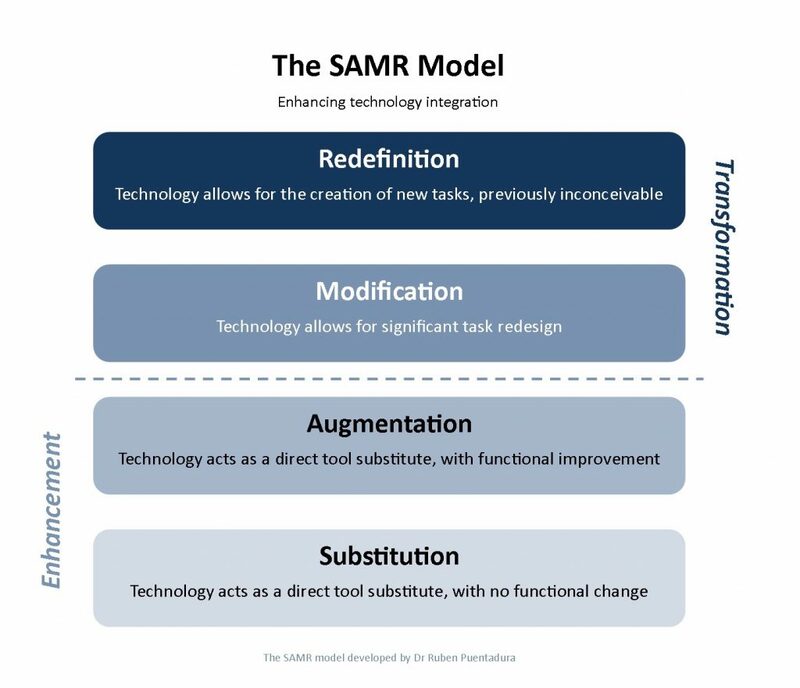 Building on the work of Mishra and Koehler, Dr. Ruben Puentedura, Ph.D. developed the SAMR Model (Substitution, Augment, Modification, Redefinition) in 2010. These framework levels explain the increasing impact of the integration from substituting another traditional learning method (such as writing with pen and paper) to create a completely new learning style (such as students complete and present a team project using global video conferencing and a virtual classroom). The SAMR model can be applied to more than just technology. See the table below to see how you can apply the SAMR model to other aspects of the classroom environment. The Technology Integration Matrix is similar to SAMR but goes to a deeper level as in incorporates characteristics of meaningful learning environments with levels of technology integration creating twenty-five levels of integration. The Technology Integration Matrix provides useful examples of what these different levels look like in the classroom with lesson samples and video examples. To access these examples, click on “more” in each box of the Technology Integration Matrix.